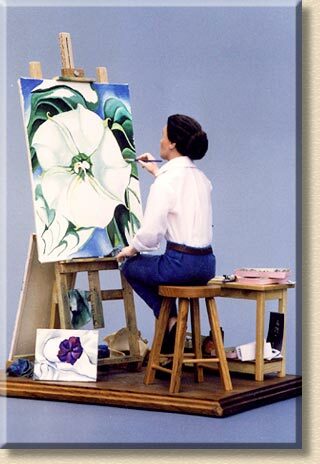 Georgia O'Keeffe seated at her easel working on her famous "Jimson Weed". 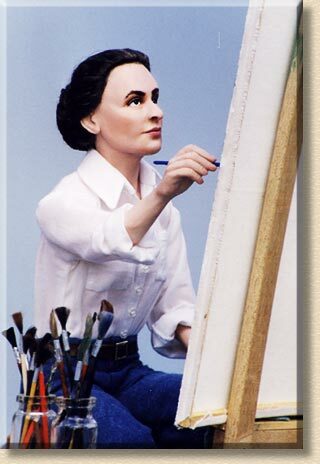 Around her are two more paintings, jars with brushes, tubes of paint, and letters and photos from her husband. Media: Head, arms and feet of Super Sculpey on a wire armature, with a cloth body. She has dark brown mohair pulled back into a bun. 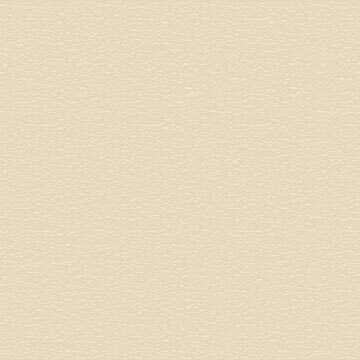 She wears leather shoes, blue jeans, and a white cotton shirt. Props: All the paintings were painted by Marianne on handmade canvases. Handmade wooden easel, table and stool. Jars of brushes made from wooden toothpicks with mohair bristles. Photos and letters scanned and printed by Marianne.